If you think about all the grasping and gripping you do in your daily life, such as opening doors, driving, working out with weights, etc., it’s pretty obvious that you use the muscles which flex your fingers far more often than the ones which extend (or straighten out) the fingers. Over time, this results in overdevelopment of the finger flexors relative to the extensors. 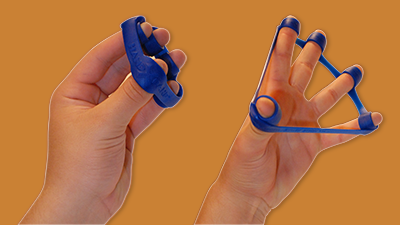 A new product called the Hand X Band enables you to selectively exercise the finger extensors, establishing muscular balance and increasing strength. These clever bands are inexpensive, durable, and effective. The Hand X Band is great for athletes who want to balance their strength and muscular development, but it is also excellent for upper extremity rehab. Glad you posted this. I lifted for years until right wrist crushed then fused with bar inserted. So no more lifting beyond light stuff. My right hand has atrophied over last 20 years so this will possibly be a good maintenance tool. Thank you.